I have had the worst cold. I still have it. It's horrible. I've become a mouth breather! 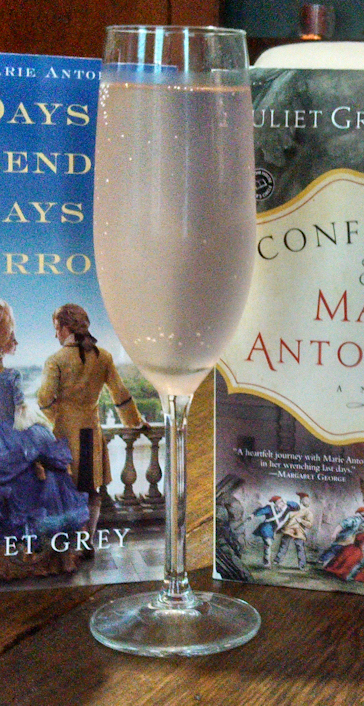 This weekend, starting now, I plan to finish up Days of Splendor, Days of Sorrow, the second book in Juliet Grey's trilogy about Marie Antoinette, and start on the final book, Confessions of Marie Antoinette. Pictured with those books is my drink (addiction) of the moment, Fentimans Rose Lemonade. It's sour, sweet, a tiny bit floral, and carbonated. While I've been home and feeling pathetic, I've been drinking it out of champagne flutes like I'm a fancy woman of leisure and not an unceasing snot factory. Plus, sweet floral-y pink carbonated beverages seem especially suited for books about Marie Antoinette, right? Sorry to hear you are under the weather! I'm reading "An Arsonist's Guide to Homes in New England"
Oooh, what do you think of it so far? I've heard very mixed reviews, but I bought it last year on the title! Yummy, rose lemonade sounds delicious! I hope you feel better soon! Oooh, that looks delicious. I've heard of warmed lemonade with whiskey for a cold, so why not bubbles? As my mom used to say, "Can't hurt, might help." I'm reading Lady Audley's Secret by M.E. Braddon this weekend, because there's nothing like a Victorian soap opera to put your own drama into perspective :) Hope you are feeling better soon! Oooh, if that's not on my Classics Club TBR it should be -- I love Victorian soap opera! Summer colds are so annoying. I hope your feeling better soon and it's gone quickly. I really enjoy drinking out of different kinds of glasses. 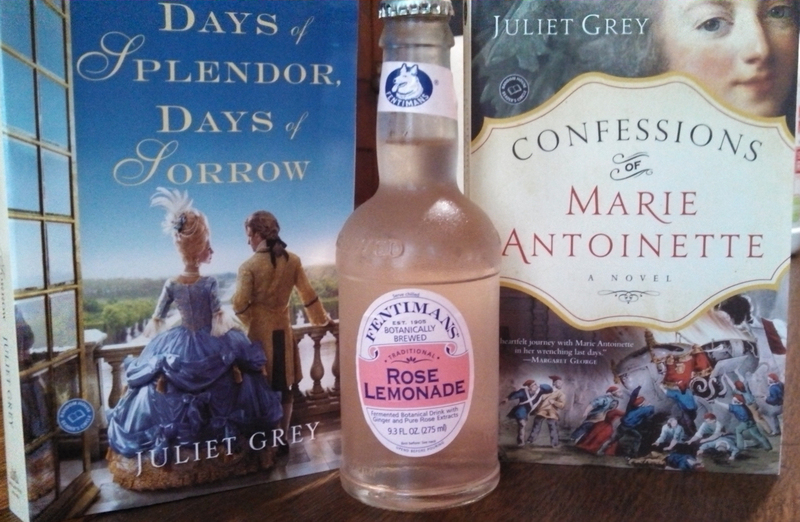 Your fizzy rose lemonade sounds perfect for champagne glasses especially while reading about Marie Antoinette. Now you just need some rich, sugary fancy pastries, preferably with pink & white icing! I hope you have a good weekend, Audra And feel much better. Sorry you're feeling so badly! But whoa that rose lemonade sounds amazing. I need to try to find it. SO good. I got myself some sun, which has slightly perked me up. That lemonade sounds yum! Enjoy it! Feel better soon! I just finished Kate Quinn's The Serpent and the Pearl. That was a great read, as always from her. :) I think I may star Letters From Skye by Jessica Brockmole. I've been positively foaming at the mouth in anticipation to read that book and haven't had time, but IT'S ON! P.S. I forego your lemonade for a glass of grenache, though tomorrow afternoon I may have to pick some up! OH! And I'm looking forward to your reviews of the Marie Antoinette Series. I've been thinking about buying those books! I'm finishing The Last Summer of the Camperdowns, but haven't decided what to go on to next. I have Arsonist's Guide on my Roof Beam Reader TBR Pile Challenge list, so I should read that! Sorry you're feeling so bad, but maybe you'll be able to sit outside with your lemonade this weekend! Fancy schmancy! Love it ;) Summer colds are simply the worst, uck. I hope you're feeling MUCH better soon! This weekend I read The Cuckoo's Calling by Robert Galbraith, which as everyone knows by know is J. K. Rowling's new mystery. Mixed reviews! I also finished Beautiful Ruins by Jess Walter.